Happy Wednesday everyone! Today I am talking all about my favorite kitchen hack for college students (or anyone without a stove)! Living in a dorm room is soo fun, but let's be real, the cooking situation is not. After eating dining hall food 24/7, to "cooking" up frozen food, you are looking for a great tasting meal right?! Well, I now have the answer to your prayers. ToBox is one of my favorite new finds ever. This company specializes in bringing you the best quality products at a price that doesn't break the bank. They are able to do this because they cut out the middle man and get their products straight from the manufacturer themselves. I think this is awesome because I know that I am getting products from the world's greatest brands at such a great price! Without a stove, you can't make soups, pastas, and a vast amount of other yummy dishes. But, thanks to ToBox, that won't be an issue anymore. I got to test out the Induction Cooktop which acts like a stove. You just plug it in and voila, you can make eggs, spaghetti, anything really! This cooktop is super simple to use and comes with a ton of great features! There is a power button which easily turns it on and off, a timer, and temperature controls! The temperature control is probably my favorite part of this stovetop because I can easily turn it up hotter or lower with a touch of a button! 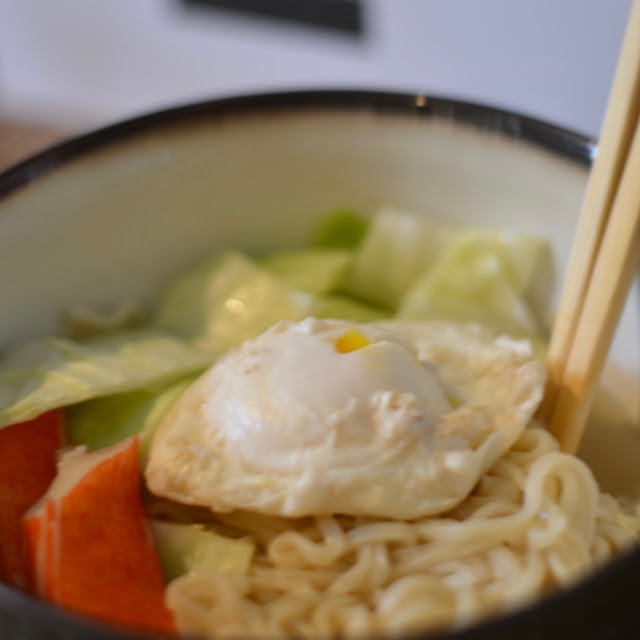 One of my favorite foods is ramen, but not the boring one that you make in the microwave. I love ramen that has veggies, yummy broth, and other things in it! So, I made the ultimate hack for you college kids out there. With this stove you can make 'gourmet' ramen right in your dorm room! It's super simple and easy. This literally took less than 15 minutes to make, so you can have a quick and easy meal in between classes. Watch the video I made down below to watch this stovetop in action and see just how easy it makes cooking! You can now purchase your own stovetop or other gadgets on ToBox's website here! PLUS, you can get a nice discount with code Glam15 ! You are all so creative, I am excited to see what you all come up with using this induction cooktop! Please tag or DM me your photos and videos! 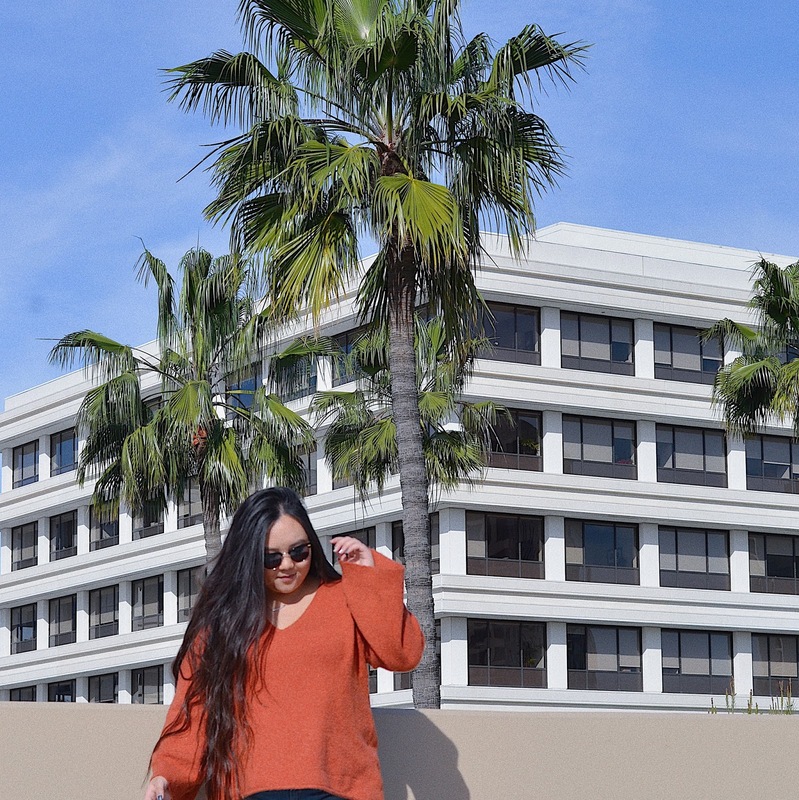 One of the best parts about living in the Golden State is that I get to experiment with my Spring styles right now during the Winter! I have been a long time fan of Berkshire and they recently launched newly designed anklets that is perfect for Spring time! This season is all about anklets, and they made so many different styles and designs including opaque, shimmer, fishnet, and lace. My favorites are the daisy floral and sheer dot design! One of the reasons that I love Berkshire so much is the fact that they make products that allow us to showcase our personal style. You can wear these anklets with boots, heels, anything! I personally love the anklet and heel trend. It adds a girly/feminine touch to any outfit. I know I am going to pair these anklets with a cute springtime dress and heels (like the ones pictured). These are extremely easy to put on and very cushiony for all day comfort. In addition, Berkshire is perfectly priced! 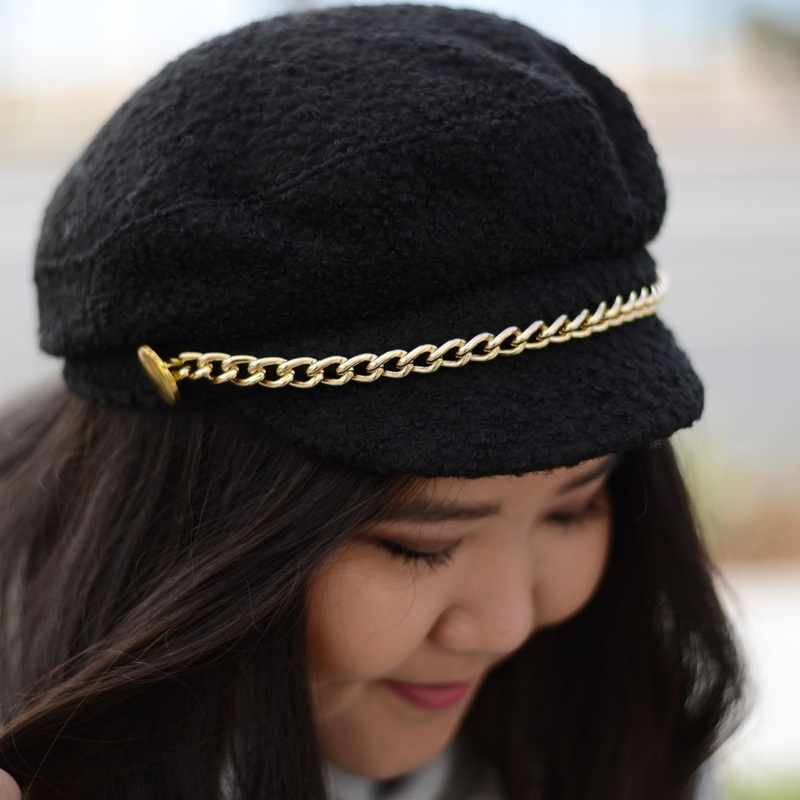 For a student on a budget, you should not have to break the bank to look cute. These NEW anklets are only $6!!! Alright, so I know I promised a discount on these, so here is the low down. Head to the Berkshire website from 3/15-4/1 and get 25% OFF all purchases! That would make these only $4.50! Plus, you can use this discount towards any of their other awesome products. This is an insane deal, and I know I will be taking advantage of it! I would love to see how you style your anklets! If you post on Instagram, tag or DM me! I love getting inspiration from all of you. Be sure to follow me on Instagram because I am going to post a full styled outfit with these anklets! OHMYGOSSSHHH! 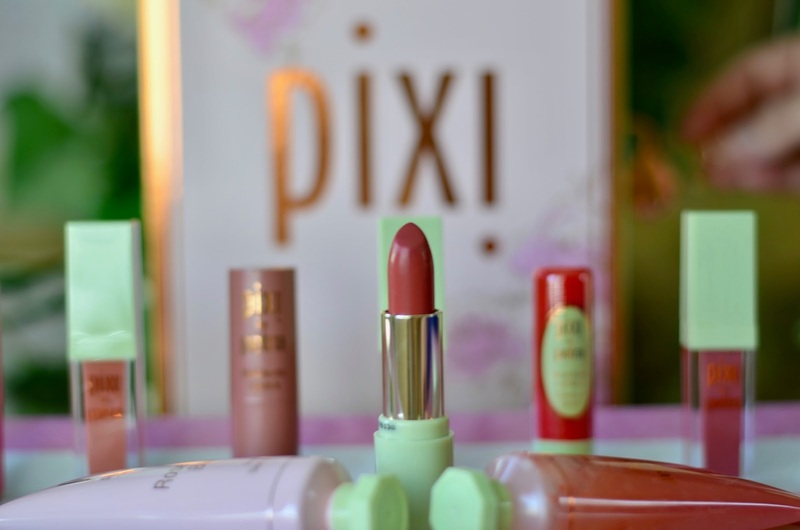 I received literally the coolest and best box from Pixi beauty last week! As seen in the photos below, it was a big box with a lock and key. I "unlocked" the secret to beautiful lips and great skin. The contents inside the box were their Rose Flash Balm, Rose Caviar Essense, and 6 MatteLast Liquid lips! I was so in awe over how amazing this package was and that I was even receiving it. 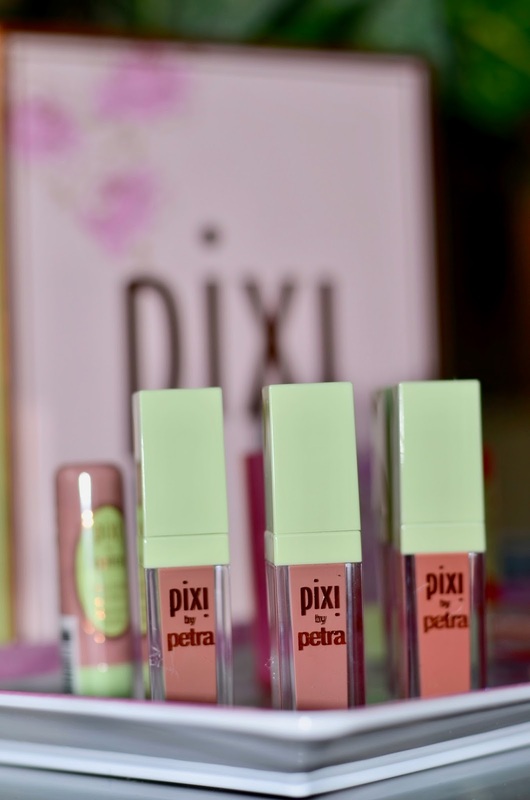 Pixi Beauty is one of my all-time favorite brands. 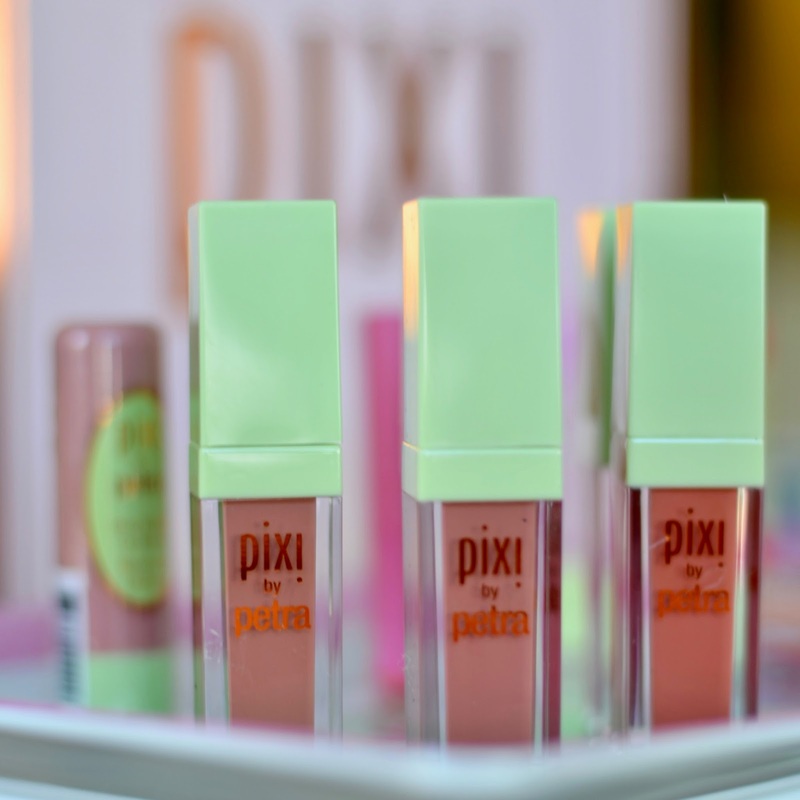 I am obsessed with their Glow Tonic, eyeshadows, and lips! So, this was so so amazing. I can't thank them enough! 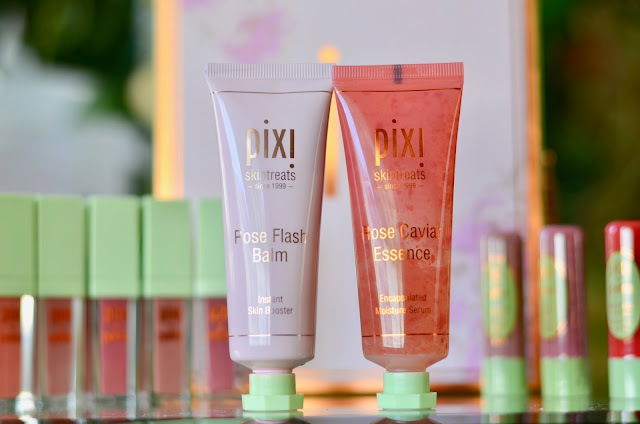 Here are a couple photos I took of the Rose Flash and Rose Caviar. I thought that the cool streaks of light gave the photos an awesome look. Plus, since it's almost Valentine's Day, I thought it was appropriate to photograph it next to my favorite candy conversation hearts tray. I have been using these two items for the past week, everyday. I have noticed a difference in my skin greatly. My skin has been super dry and almost flaky lately. 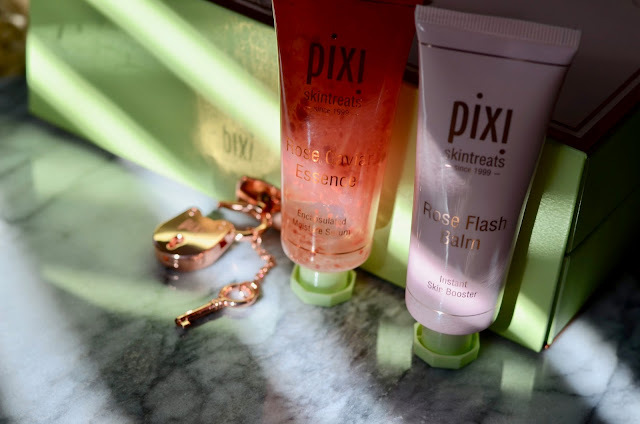 I love using the rose flash balm as a skin booster to make it more radiant and then finishing up with the Rose Caviar Essence to moisturize my face. They both smell so great and I love the little flecks of rose in it. Also, if you didn't know, you can use the Rose Flash Balm as a face mask! Just apply a thick layer to your face! Ahh, this is my favorite MatteLustre lipstick. I just had to take it out for this photoshoot. 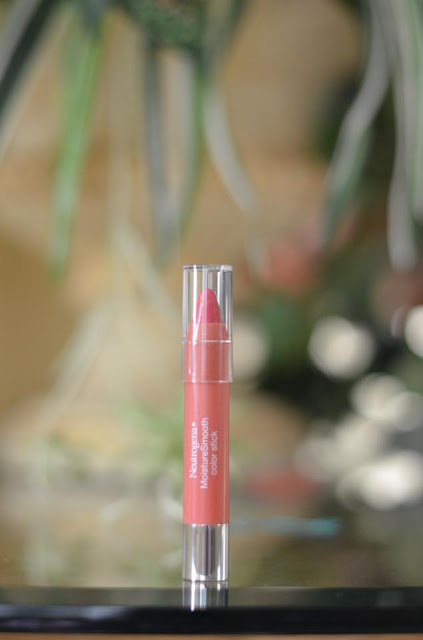 It is the perfect color for me and I wear it at least 4 times a week. I cannot say enough about these liquid mattes! They glide on so easily and dry down completely. The colors are perfect for my skin tone. I am a huge fan of nudes as well as berry toned nudes. I am so glad that I unlocked ;) these beauties! I have been using them all the time. 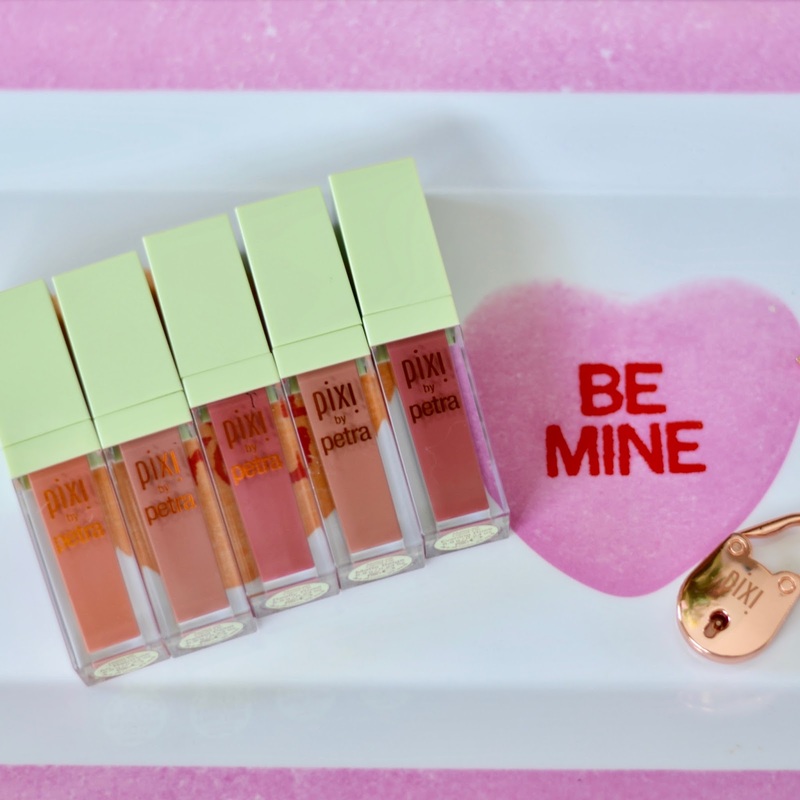 The colors are so versatile and match with any makeup look! Not to mention, they were a Cosmopolitan Beauty Awards UK winner in 2017!!! Plus, the price of these cannot be beat! I will link down everything I have talked about below. Also, the best part about all of these products?! They are ALL less than $25! It's beauty that won't break the bank. High quality products for a great price. You can't beat it! One of my resolutions for 2018 is to take better care of my skin! This includes actually carrying out a daily skin care routine and drinking loads and loads of water. I have combination oily and dry skin, but lately my skin has been just dry...like super dry. My current routine consists of: cleansing, toning, moisturizing. Pretty simple and straightforward. 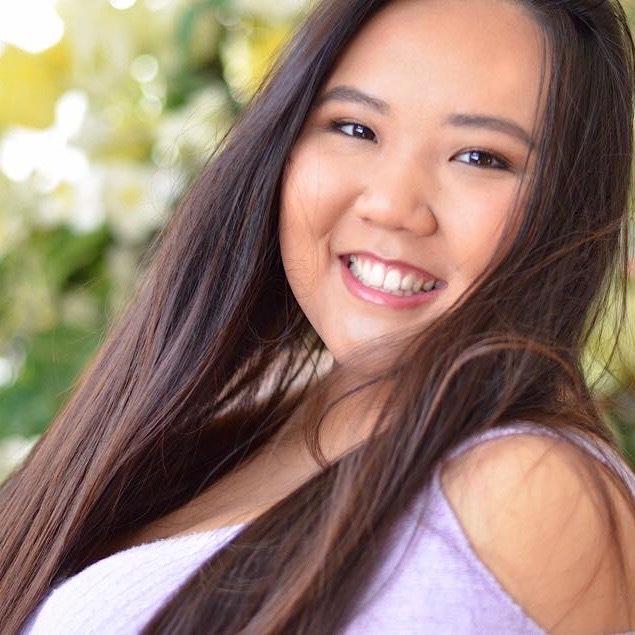 I have ocasional breakouts, but I am just really trying to focus on the health of my skin. This moisturizer feels so luscious when putting it on! 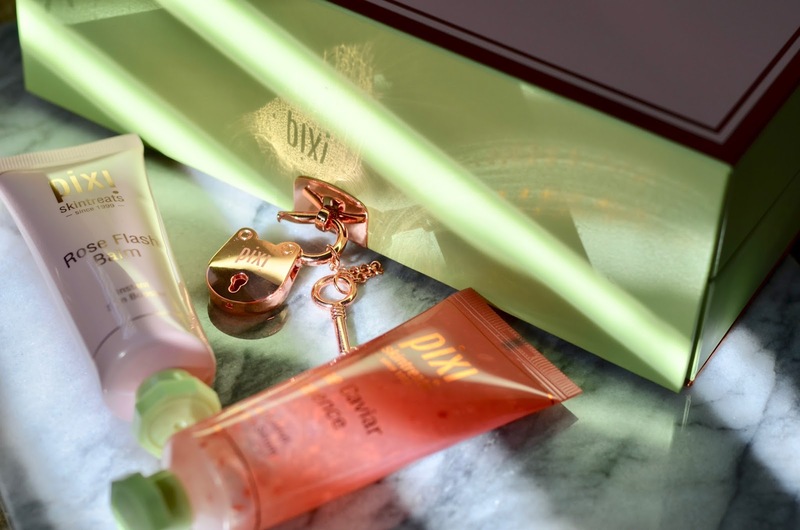 When I put it on after toning, I noticed that it absorbed extremely quickly. I think that it is great that it even stays absorbed after I wash my face. After one day of use, I noticed the next morning that my skin was super soft and barely had any dry patches left. By the end of the week, my dry patches were gone, and my skin was as hydrated and smooth as a baby's bottom. 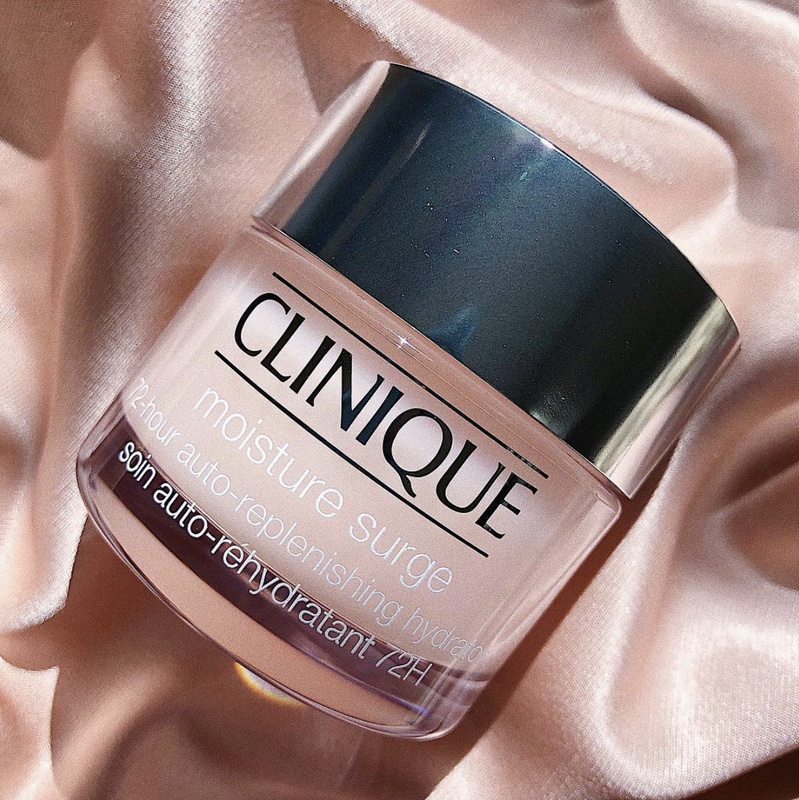 I have been a huge fan of Clinique my entire life. I use Clinique products for whole face makeup, too. I am currently using their foundation, powder, eyeliner, makeup remover, and lipstick. I am just an avid Clinique fan and was so excited to get to try this new product. It definitely did not disappoint! If you have any questions about this or any new recommended products I can add to my skincare routine, feel free to message me or comment down below! Don't forget to follow me on Instagram to keep up to date on what I am doing with my life! Here I am featuring just two of my pieces from the box. 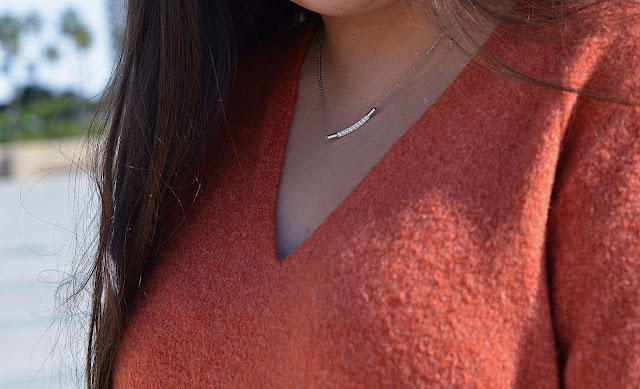 I got this super stylish and oversized burnt orange sweater from French Connection and a super cute bar necklace! I paired it with my favorite pair of Levi's and some black heeled mules. 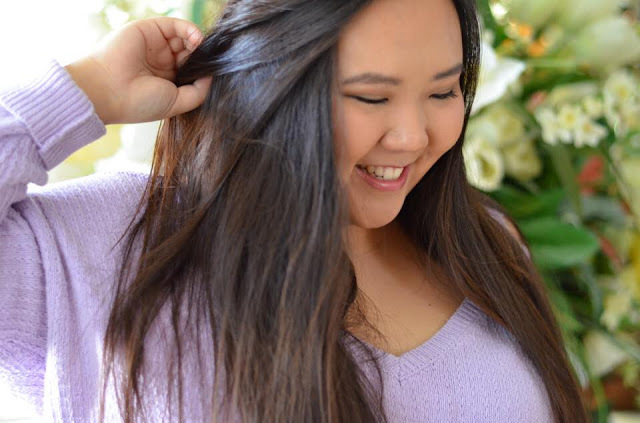 The sweater was so cozy and soft I never wanted to take it off! I loved how the necklace added a dainty shine to my look as well. Lastly, the other part that I love about Le Tote is that you get unlimited boxes each month. So for example, you receive your first box, wear all of the items, send them back a week later, and then you are able to order another one with handpicked styles! And this cycle can continue on and on each month as many times as you would like! It is a great way to try out different styles and looks. I personally love Le Tote. They have so many different brands to choose from. They even carry workout items! Be sure to check out Le Tote! Today, I am going to be talking about Neutrogena and their Healthy Skin product line! 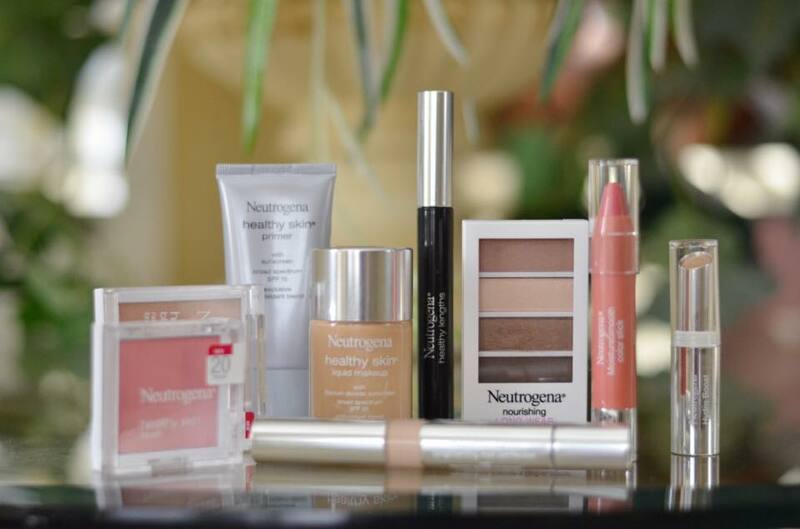 I am so so excited to be working with Neutrogena again. 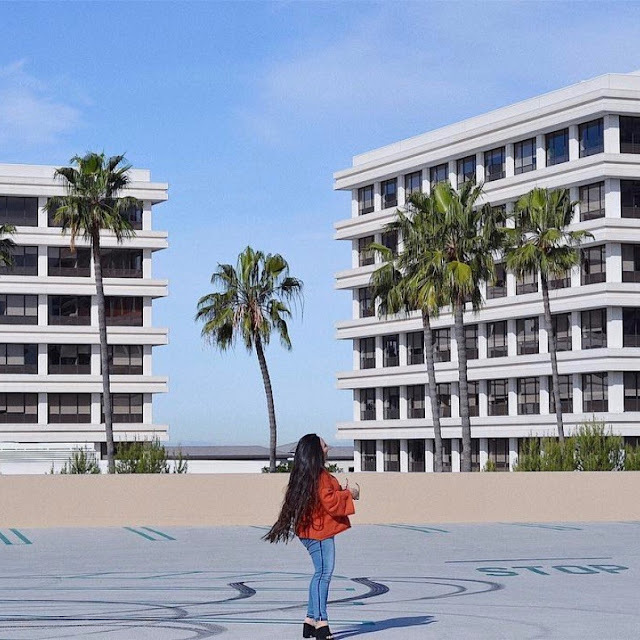 They have the best products that are such high quality for a great price! I created the look above using only the products pictured below. I wore this look all holiday long- to Christmas and New Years parties! I did not edit my skin or anything at all! 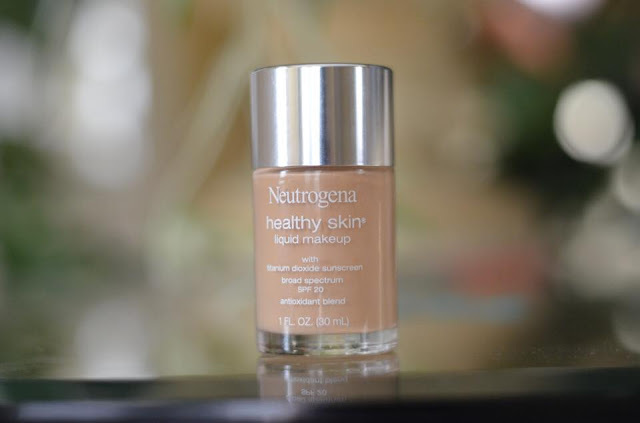 I am glad to be using Neutrogena foundation because it is great for my skin and makes me look flawless. 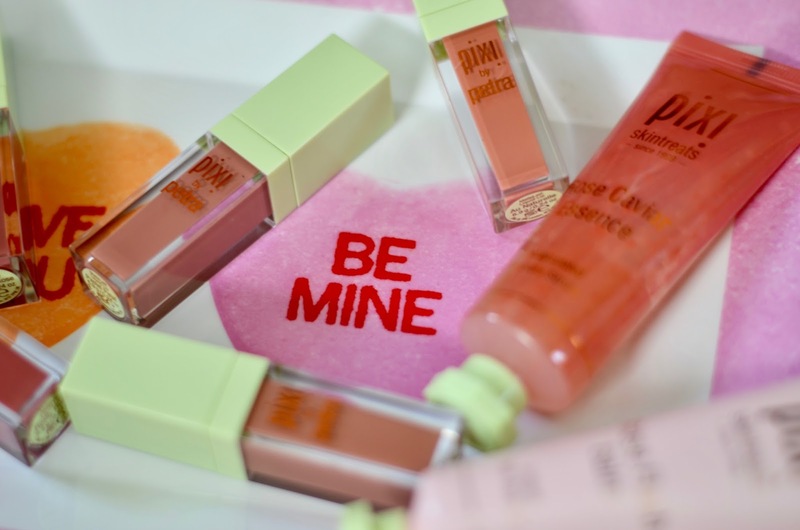 I'll review some of my favorite products from this line below and a link to all of the products at the end! All of the products I used from their Healthy Skin line that was used to create Eiza's metallic bronze eye look, found here! Close-up of my natural, dewy look. 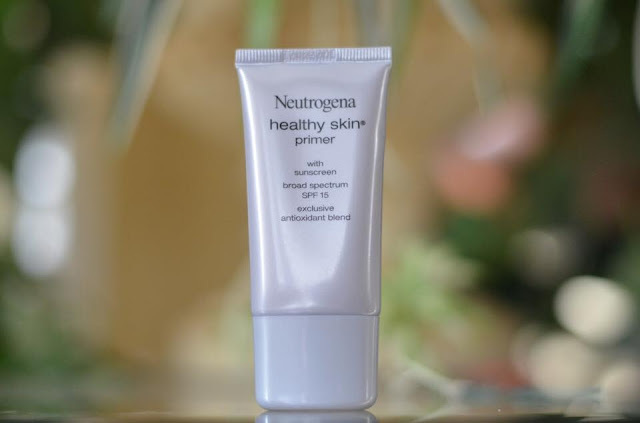 This primer is great because it feels kind of like a moisturizing lotion. And, you can't beat that it has SPF in it. It creates a great blank canvas for the rest of my face makeup. I cannot rave enough about this foundation. It is SUPER full coverage. I had a couple pimples and this covered it up no problem. My skin looked so smooth and even-toned. 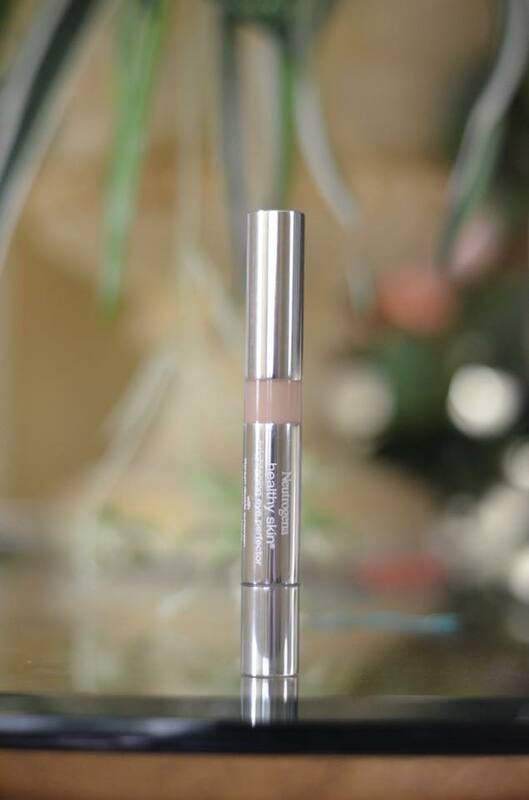 I use the shade Natural Beige (60). In addition, let me just tell you that this blends like a dream! I used a damp beauty blender and it created my awesome complexion. This is the Healthy Skin Eye Perfector. I have extremely heavy and dark bags and this helped to cover them completely. I love it so much. The color I use is light. 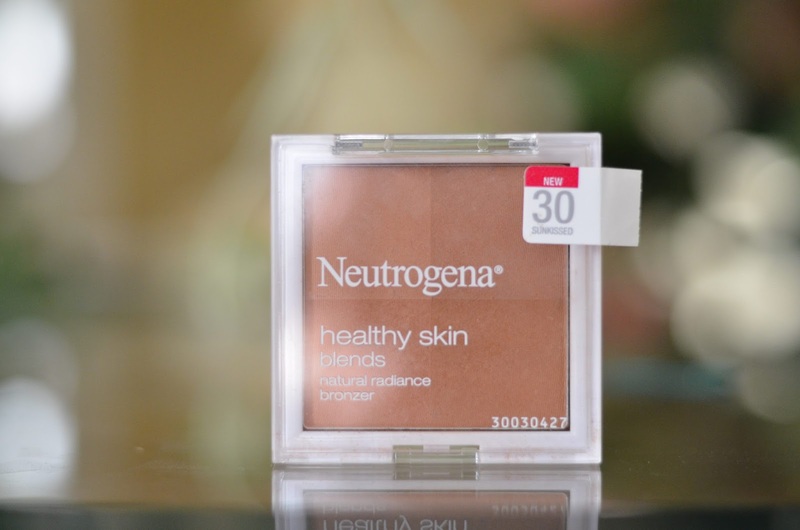 This bronzer is my new favorite! There are four different shades in this little compact, but I just swirl my brush around the whole thing in a circular motion. 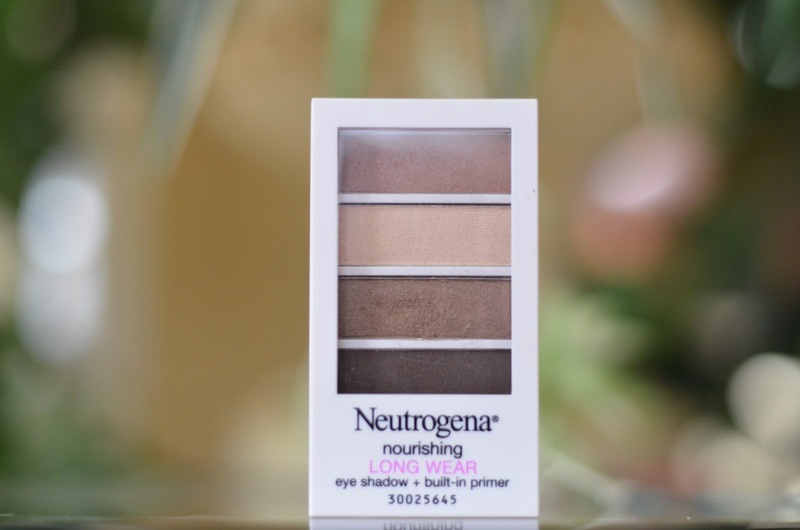 It creates the perfect bronzed color for me! This mascara is amazingggg! 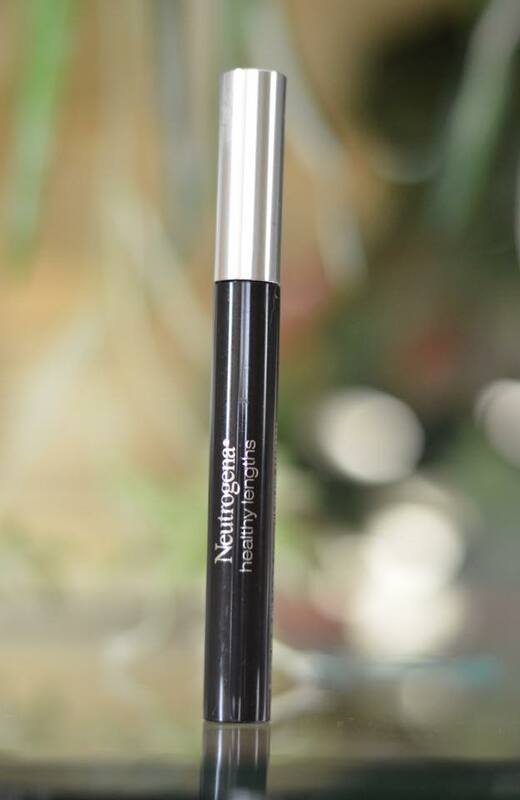 It makes my lashes double and maybe even triple in length for nice and thick lashes. I only have to do two coats and my lashes are ready for a day out! This color stick is SO hydrating. Before I put it on, my lips were a little dry and cracked. After I put it on, my lips were hydrated and did not flake at all. Also, the color is so cute and perfect! Ahh, my favorite part- eyeshadow. I really like this little palette because you can create multiple looks with it. I'll explain what I did in my eye look. I used the second color all over the lid and into my crease to create an even base. Second, I took the top color and deepened my crease with it. Next, I took the last color and buffed it into the outer V of my eye for a little smoky eye. Lastly, I wet my brush and packed on the third color all over the lid for a metallic and bright lid to tie the whole look together. That's a secret of mine that I do. With shimmery eyeshadows, I like to use a wet brush so that the shadow will become metallic-like and looks amazing on the lid.